This week, the #SundaySupper krewe is celebrating Mardi Gras a few days earlyvia today's Fat Sunday Celebration! Our hostess this week is Leslie from La Cocina de Leslie. Have we got a celebration feast for you, my friends! We've got it all. Everything from cocktails to get the party started...to desserts to end your celebration on a sweet note. I was so excited to take part in this week's event, because Michael and I absolutely love New Orleans. The food is fabulous...and the people are friendly and welcoming. Michael also proposed to me there, so The Big Easy also some great sentimental memories attached to it for us. Growing up on the Texas Gulf Coast, we were close enough to Louisiana to have lots of exposure to amazing Creole and Cajun dishes. I couldn't decide what to make this week -- did I want to make gumbo...or maybe even try my hand at a homemade King Cake? In the end, jambalaya won out over everything else. I love jambalaya for lots of reasons. First off, jambalaya is a complete meal in a bowl: rice, aromatic veggies, spices and some kind of protein. One pot = less cleanup and a happier me! I also love to make jambalaya because it's great for feeding a crowd. Simply bring the finished pot to the table, and everyone gathers around to serve themselves a bowl. It's also a very versatile dish. Whether you choose to make it with seafood, chicken, sausage...or any combination...it's going to be delicious. I normally make my jambalaya with chicken and andouillle (ahn-doo-ee), a spicy Cajun smoked sausage. 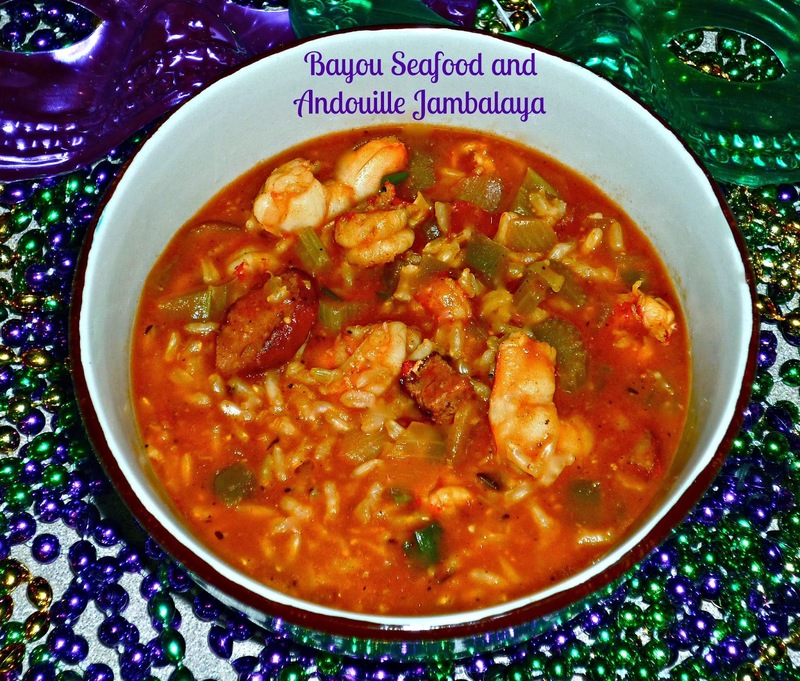 For today's event, however, I decided to make Bayou Seafood and Andouille Jambalaya. It features fresh Gulf shrimp and Louisiana crawfish tails...with a bit of andouille to bring some smokiness to the finished dish. This hearty jambalaya packs a ton of great flavor. Step 1: Heat the olive oil in a 5-quart Dutch oven on med-high until the oil and pan are hot. Add the andouille (or smoked sausage) and cook until browned. Add the onion, bell pepper, celery. Cook until the veggies are soft and the onion is translucent, about 5 minutes. Stir in 1 tbs. of the Cajun seasoning, and salt & pepper to taste. Step 2: Add the rice, tomatoes, and chicken stock to the pot. Stir well to combine. Add the bay leaves and thyme on top of the mixture in the pot. Just don't forget to remove them before serving the finished jambalaya! Bring the mixture to a boil, then reduce heat to medium-low. Cover and cook at a slow simmer. Step 3: While the rice mixture cooks, place the shrimp and crawfish in a bowl and toss with the remaining tbs. of Cajun seasoning. After the jambalaya has cooked 30 minutes, add the crawfish and shrimp. Give them a stir to combine. Cover, turn heat to low and cook 15 more minutes. Add the green onion, turn off heat, and let the jambalaya sit covered for 15 minutes longer. To serve, ladle into bowls. A pot makes approximately 5-6 servings. Everybody who tried this jambalaya really enjoyed it. It has a nice amount of heat, a smoky background flavor from the andouille, and tons of sweet seafood. This was my first time to use crawfish in jambalaya, and I really liked it. This jambalaya is definitely delicious, but I have to disclose that it came out much more saucy than my usual jambalaya recipe from Chef Paul Prudhomme. It reminded me more of shrimp creole than traditional jambalaya, but it was indeed tasty. I suspect the sauciness is because the recipe calls for crushed tomatoes. If you prefer your jambalaya drier, I'd use a can of well-drained petite diced tomatoes instead of crushed tomatoes. Wait until you see all of the fabulous New Orleans-inspired dishes the rest of the #SundaySupper participants are sharing this week. There's guaranteed to be something that you'll want to make part of your Mardi Gras celebration this Tuesday! Fire up some zydeco music, put on some colorful beads, and definitely "Laissez le Bon Temps Rouler!"